Status: Abundant regular spring and fall migrant statewide. Common, locally abundant, regular breeder northcentral, fairly common elsewhere. Uncommon regular local winter visitor North Platte, lower Platte including Lancaster Co and adjacent Missouri River Valleys, rare casual elsewhere. Documentation: Specimen: UNSM ZM12607, 4 Aug 1911 near Henry, Scotts Bluff Co.
Taxonomy: Two subspecies are recognized, columbiana of Colombia and Ecuador, and americana of North America south to Costa Rica and the Caribbean (Gill and Donsker 2017). Nebraska birds are americana. Migrants begin to arrive in late Feb, reaching peak numbers in mid-Apr. By late May, remaining birds are mostly local breeders. An unusually early group of 350 migrants appeared at Carter Lake, Omaha 6 Feb 2012; this lake had had open water all winter. High counts: 6000 at Carter Lake 10 Apr 2014, 4500 there 13 Apr 2012, and 4000 at Lake Wanahoo, Saunders Co 23 Apr 2013. Summer: American Coots breed statewide with the exception of areas where habitat is lacking such as eastern Nebraska and the southern Panhandle. The highest breeding densities occur on Sandhills lakes. The Rainwater Basin supports sizeable numbers in wet years (Jorgensen 2012), but water levels are variable there and during dry years it may be absent. Water conditions allowed for “what could be a banner coot production year” in the eastern Rainwater Basin in 2007; some 48 nest mounds were found at four sites 26 May, including 27 at Tamora WMA, Seward Co. 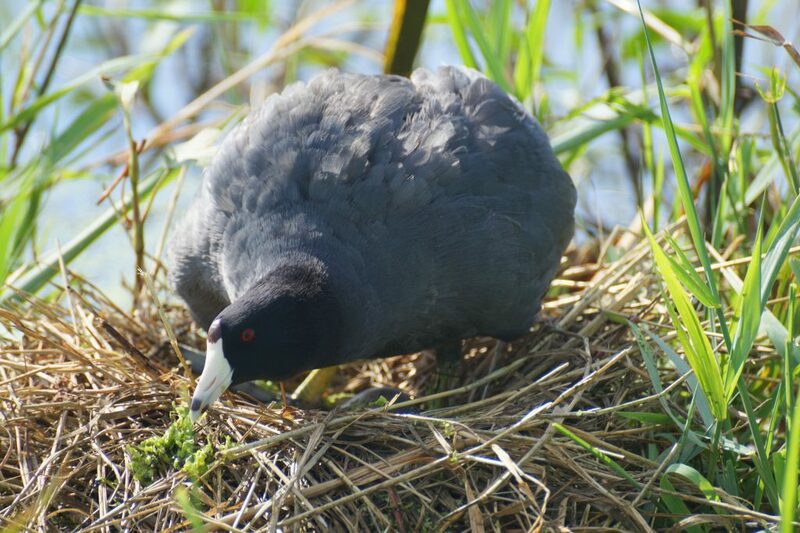 Numerous coot nests were found in the Rainwater Basin in 2015 also (Jorgensen 2016). Migrants begin to appear in late Aug, and flocks become noticeable from then on. This species undergoes a post-breeding molt mostly in Aug, often migrating to larger lakes (Alisauskas and Arnold 1994); such aggregations are thus earlier than those of true migrants. Large flocks of the latter occur at any time Sep-Oct, but numbers decline with the onset of colder weather and freezing conditions in Dec and Jan. An unusually high Dec count was the 6007 on the Lake McConaughy CBC 31 Dec 2011. High counts: 17,359 at Capitol Beach Lake, Lancaster Co 24 Oct 2009, 8000 at Lake Ogallala, Keith Co 28 Sep 2012, and 6315 at Crescent Lake NWR, Garden Co 15 Sep 1978 (Fred Zeillemaker, pers. comm.). Winter: Numbers in late fall and early winter are dictated by weather and ice conditions. Overwintering requires open water throughout the winter; most reports in recent years are from the North Platte River Valley and Missouri River counties. Statewide, numbers are lowest mid Jan to early Feb.
High counts: 1316 at Lake Ogallala 5 Feb 2000 and 586 there 23 Jan 1999. American Coot guarding its nest at a wetland in the Rainwater Basin 26 Jul 2015. Photo by Joel G. Jorgensen. Alisauskas, R. T., and T. W. Arnold. 1994. American Coot. Pages 126–143 in Migratory shore and upland game bird management in North America (T. C. Tacha and C. E. Braun, Eds.). International Association of Fish and Wildlife Agencies, Allen Press, Lawrence, Kansas, USA.